The cooling system in your vehicle is one of the most important and often overlooked elements of your entire engine. The engine combustion reaches temperatures of over 2000° F, and it is critical for your system to be operating properly to keep your engine from overheating. When your engine overheats, it can cause serious damage to the entire drive train. Over time your anti-freeze will wear down and lose its effectiveness to properly cool your engine. In order to prevent this from happening, it is important to follow the recommendations from both the makers of your anti-freeze, as well as those from your vehicle manufacturer. 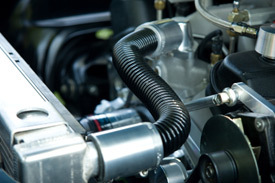 At Metro Transmission and Automotive we understand the importance of the coolant system in your vehicle. We do all we can to help prevent expensive repair costs for our clients with our cooling system services. If any of the following is true for your vehicle, it may be time to stop in and let our certified experts take a look at the situation. If after our technician inspects your vehicle and determines there is a repair or replacement needed, we will walk you through your options. Our goal is to correctly fix the problem the first time, keep you safe while you’re on the road, and provide you with the knowledge needed to make the best decision possible. When it comes to your vehicle’s cooling system, there are 5 main areas where a problem could arise. Our ASE certified technicians are experienced in all areas your vehicle’s cooling system, and we are confident we can resolve the problem the first time with our cooling system services. With over 30 years of experience, we know how to get your vehicle back on the road, and keep it there!